Two new bypasses could be built near Glastonbury within the next decade. The Department for Transport (DfT) is asking local authorities across the UK to put forward suggestions of road schemes which could reduce congestion. 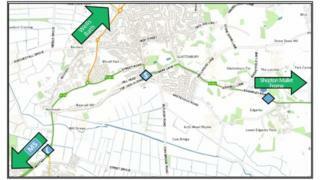 One bypass plan is for the south of Glastonbury and the other to relieve the nearby villages Walton and Ashcott. Somerset County Council said the bypasses would help to improve quality of life for residents, and deliver housing and employment growth. Up to 10 proposals will be submitted to the DfT to try to bring economic benefits and/or allow housing to come forward, the Local Democracy Reporting Service said. Two options have been put forward for the Glastonbury bypass. Both begin on the A361 Edgarley Road, with the short option terminating at Bere Road and the long option linking up with the A39 at the Westway roundabout. The Walton and Ashcott bypass would run for four miles around both villages, with the intention of removing 95% of the current traffic from the A39. A spokesman said: "A relatively high number of collisions have taken place along the route in the past five years." The Glastonbury bypass could cost between £40m to £70m depending on the route taken, of which at least 15% must come from the county council, while the Walton and Ashcott bypass could cost up to £90m. The Peninsula Transport Shadow Sub-National Transport Body will meet again in June to approve the details of these proposals, which will be submitted to the DfT in July. If both are successfully funded, both routes would begin construction in 2023 and be open to the public by 2025.